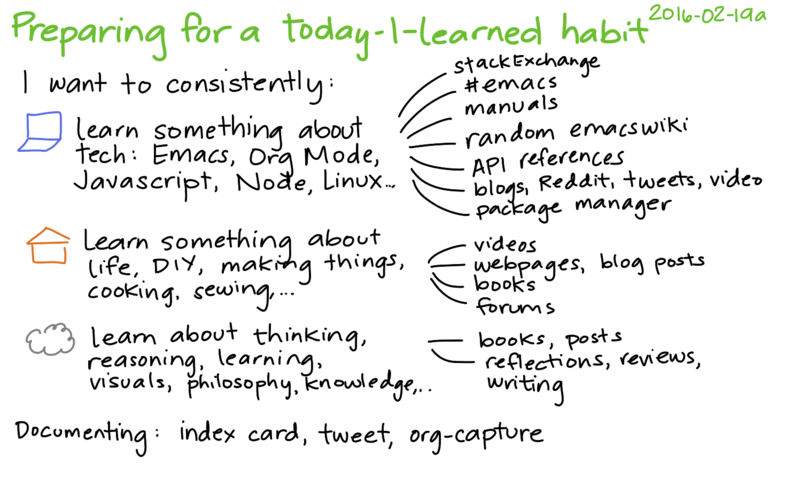 I’d like to build a habit of regularly learning one small thing each day in one of three domains: tech, life, and learning. 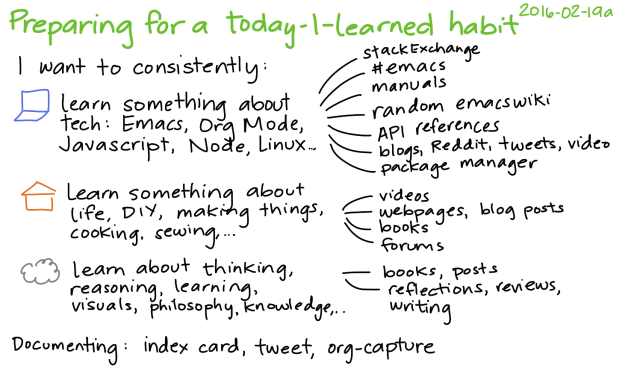 My measurable output would probably be in the form of index cards, tweets, blog posts, and notes (in org-capture, Dropbox, or Evernote). I can get input from various sources like blog posts, videos, books, webpages, and so on. A little bit of randomness might be useful for learning more about Emacs. Emacswiki has a random page function, but the chunks are often a little large or irrelevant. On the other hand, displaying a random command from the packages that I already have loaded into my Emacs – that might be a good way to discover interesting things. "Show the documentation for a random interactive function. Consider only documented, non-obsolete functions." I’ve added this to a key-chord + hydra keymap as a repeatable function, so I can type hh to start my Hydra and then type r as many times as I want in order to show the documentation for a random interactive function. If you’re curious about that, you can see the key-chord section of my config.